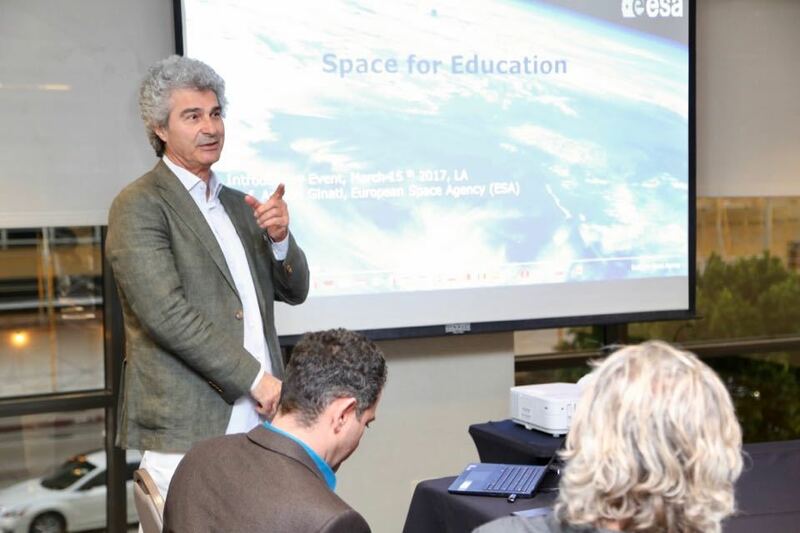 On March 15, 2017, the Einstein Legacy Project and the Shuki & Tori Levy Foundation co-hosted a dinner in Los Angeles with special featured guest Prof. Amnon Ginati of the European Space Agency. The dinner brought together an exciting group of creative, dynamic influencers to hear about the new partnership between the ESA and the Einstein Legacy Project. As part of his fascinating presentation, Prof. Ginati touched on some brilliant examples of how space applies to our everyday lives. He also discussed a key educational initiative that the ESA has launched in partnership with The Next Einstein, with a goal of bringing educational tools, internet and resources to rural and impoverished communities globally. Space 4 The Next Einstein is already bringing technology and education into African villages, where children are being exposed to internet technology for the first time. The project aims to break the digital divide, making education free and available to anybody who seeks it. Learn more about this initiative by watching the video above. Prof. Ginati’s presentation was followed by a delicious Mediterranean dinner, where guests learned more about the scope of the Einstein Legacy Project. Our foundation was thrilled to be a part of making this very special evening possible.